The process of canning and preserving foods takes place for many reasons. For the gardener in all of us, home canning is a way to take all of the hard work that was done outside, and bring it inside. Canning allows us to extend the life of farm to table by ensuring you get the most out of your garden. Not only is canning and preserving economical, it’s also experimental because it makes us use foods and ingredients that might not be in the market or no longer in season. While canning may seem like a new challenging task that requires a lot of steps and precision, it’s a really simple process to that will preserve the fruits and vegetables from your garden, and keep them fresh and ready to eat for many months. 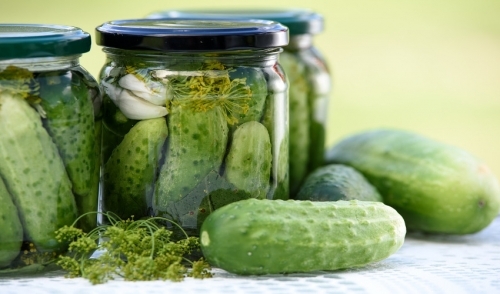 To make the most of your garden with home canning, start by picking the freshest ingredients from your garden. The point of canning is to extend the life of your garden. It won’t do any good if you’re not picking hearty fruits and vegetables to save for later. Let’s be honest, if you won’t eat a rotten tomato now, you sure won’t eat it later. Start with top quality produce from your garden and avoid any that are overripe or bruised. After you have selected your produce fresh out of your backyard, start the canning process by cooking the foods at a high temperature to remove any microorganism and bacteria that may be within the food. This also rid any remnants of fertilizer or soil from the foods. For maximum vitamin and nutrient retention, begin the canning process immediately after it’s harvested. The two most common ways to ‘can’ are the boiling method and pressure canner method. Use the boiling method for all of your fruits, tomatoes, pickles, and preserves. The boiling method is pretty simple. Once the food is boiled, it is placed into jars with pectin, which is the gelling agent that works to keep the food as fresh as possible and locks in all that flavor you worked so hard outdoors to obtain. Pressure canning is typically used for vegetables and meats. Using a pressure cooker, place your jar of food inside allowing the cooker to heat up and kill any and all microorganisms present sealing and leaving you with food that will last. Be safe while canning at home. It requires a lot of attention to detail and you will be dealing with boiling water and sharp objects. However, if you use the same effort you used to create the food, I’m sure you will have no problem preserving it. Save yourself some money and food by making the most out of your garden by canning at home.